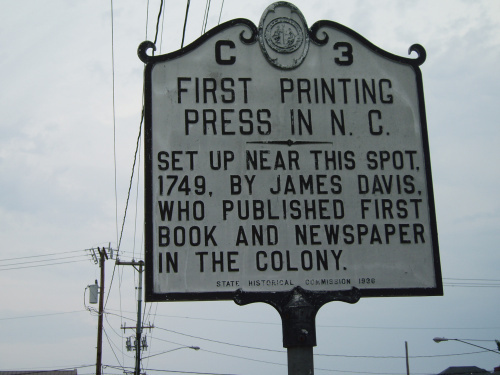 In 1749, the North Carolina Assembly voted to create the office of public printer so that a printing of revised colony laws could be completed. They chose James Davis, who was originally from Williamsburg, and had apprenticed under William Parks, the first printer in Virginia. Davis brought his press and type with him from Williamsburg and set up shop initially on Pollock Street, but later moved to the southwest corner of Broad and East Front Street. His first official job was the printing of currency. Then, on June 24, 1749, in New Bern, James Davis printed the first official publication for the colony of North Carolina entitled The Journal of the House of Burgesses of the Province of North Carolina. James Davis served as public printer for almost thirty-three years and published over one hundred documents. In 1751 Davis completed the revisal of the laws of the colony and in August of the same year, Davis began publishing the first newspaper in the colony, The North Carolina Gazette. He published this paper over two separate periods. It was first published from 1751-1760. He started another newspaper in 1764, called The North Carolina Magazine, or Universal Intelligencer, but it only lasted four years. In 1768, he resumed publication of The North-Carolina Gazette, which continued to be printed until 1778. In 1753, he published a book, A Collection of Many Christian Experiences, Sentences, and Several Places of Scripture Improved, written by Reverend Clement Hall. This book was a first in several categories. It was the first book written by a native of North Carolina and it was the first privately printed, non-legal book published in the colony. Upon his arrival in 1749, James Davis became involved in almost every aspect of life in New Bern. He purchased land and married a local woman, Prudence Hobbs, widow of Christopher Gregory Hobbs and daughter of William Carruthers. They had four sons and three daughters. He 1753 he became a member of the county court, an office he held for over twenty-five years. In 1754 he was elected sheriff of Craven County although he only kept that position for ten months. He was elected to the Assembly and later was appointed postmaster of New Bern. In 1778 he served as a Justice of the Peace. Davis was a supporter of the American Revolution and was appointed to numerous political positions during this period representing New Bern and Craven County. Published first book, first newspaper and first magazine in North Carolina.